While I enjoy a good history lesson via the movies I've never looked to the movies for history lessons. That being said, Darkest Hour looks to be a damn fine and rather exciting way to spend two or so hours learning about historical events. There are a multitude of reasons to be excited for this Winston Churchill biopic chief among them being the fact it is a Chruchill biopic that focuses keenly on a single trial in the life of the great Prime Minister. 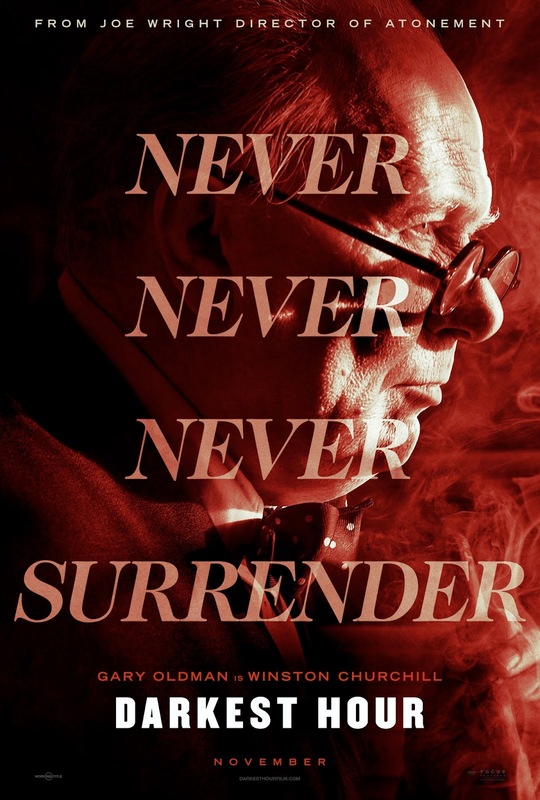 Darkest Hour tells of how Churchill, only days after becoming Prime Minister, had to decide whether to navigate negotiations for a peace treaty with Nazi Germany or stand firm in the fight against them, but for the ideals, liberties, and freedoms of his nation. Sounds stirring, right? Add to this the fact the film is directed by Joe Wright who I have more or less adored since I unsuspectingly walked into Atonement a decade ago and came out absolutely floored. Whether it be in Hanna, Pride & Prejudice, or Anna Karenina, Wright always finds a way to make every department of his movie work together in ways you didn't even know directors could. While Wright is coming off what is more or less the only disappointment in his filmography with the underwhelming PAN, I am still very much looking forward to seeing what the director has done with this material as it looks to be very much, if not necessarily a return to form, but at least an effort more in his wheelhouse. Of course, the biggest draw here is that of an unrecognizable Gary Oldman giving what is no doubt a powerful performance. There have certainly been many iterations of Churchill on film (there is even another movie with the Prime Minister as the central figure coming out this year titled Churchill starring Brian Cox), but Oldman looks to have gone more than all in with this immersive performance as not only is the make-up impressive, but even in this clip that lasts just over two minutes the actor is able to deliver a stirring and compelling performance leaving me to wonder just how good he'll be here; maybe that run of delivering consistently fantastic performances with no Oscar to show for it will soon come to an end? Time will tell, but I can only hope the film turns out to be as good as all its factors promise it should be. Darkest Hour also stars Kristin Scott Thomas, Lily James, Stephen Dillane, Ronald Pickup, Ben Mendelsohn, and opens in select cities on November 22nd, 2017. Synopsis: A thrilling and inspiring true story begins on the eve of World War II as, within days of becoming Prime Minister of Great Britain, Winston Churchill (Academy Award nominee Gary Oldman) must face one of his most turbulent and defining trials: exploring a negotiated peace treaty with Nazi Germany, or standing firm to fight for the ideals, liberty and freedom of a nation. As the unstoppable Nazi forces roll across Western Europe and the threat of invasion is imminent, and with an unprepared public, a skeptical King, and his own party plotting against him, Churchill must withstand his darkest hour, rally a nation, and attempt to change the course of world history.